I may be going out on a limb, but does anyone else know that incredible, lovely and unique smell of tomatoes? I love the smell. Right when they are fresh from the garden. Why should you eat tomatoes? Weather you call it a fruit or vegetable you should be eating more of this super-food nutrient dense goodness. Tomatoes are packed full of beneficial nutrients and and are a rich source of vitamins A and C and folic acid. 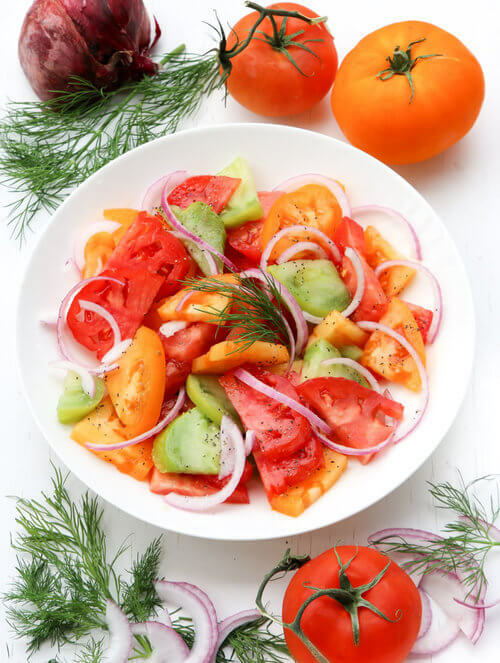 This quick tomato salad is a great way to incorporate more tomatoes into your diet. What other health benefits are in this salad? The red onion you see in this recipe will benefit your overall health by reducing your risk of getting sick with a chronic disease. This vegetable is really low calorie and contains no fat but high in potassium, magnesium, calcium and vitamin K. The olive oil is mainly tied to the cardiovascular system. It is good to eat more of because it can reduce the risk of developing a cardiovascular disease. Hope you enjoy this easy and quick tomato salad. Slice 3 large tomatoes, and 1/4 red onion. Add 1 teaspoon salt (or to taste) and 1/2 teaspoon ground black pepper. Mix everything with 2 1/2 Tablespoons extra virgin olive oil.